Hey World Cup, we're coming for you. 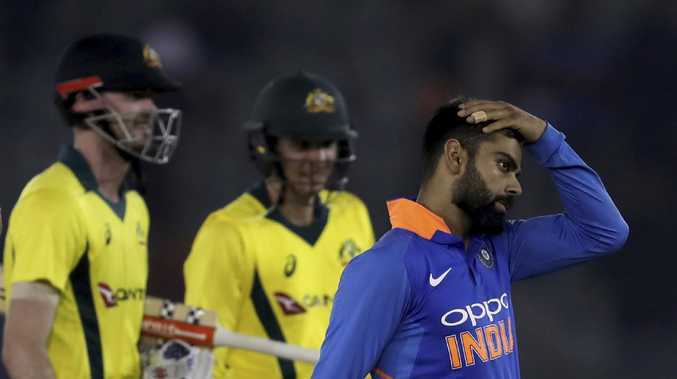 Australia showcased its 50-over credentials by producing the nation's greatest ODI chase, comfortably hauling in a target of 359 with 13 balls to spare to shock India and level its series at 2-2. Australia had never chased down more than 334 to win a one-dayer but that record was clinically smashed by Peter Handscomb (117), Usman Khawaja (91) and Ashton Turner (84 not out). "This is a really big moment for us," Handscomb said after the four-wicket win. "We haven't had too much of a debrief yet but it will be something along the lines of 'take this belief, take this confidence, this momentum, keep building'. "Because what we've done today is something special ... this gives us so much confidence. Not only going into the next game but ... looking forward to the World Cup." Handscomb, who produced his maiden ODI ton just two days after Khawaja achieved the same milestone, steadied Australia from 2-12 and set up the chase with a 192-run partnership. But it was Turner who grabbed the spotlight as he stepped up superbly when Australia required 88 from 53 balls following Handscomb's dismissal. The West Australian's 43-ball knock featured six sixes, five fours and was the most remarkable of the three impressive innings. "That was bloody awesome!!!" Glenn Maxwell tweeted post-match. "AT was incredible." "AT take a bow!!!!" added Mitchell Johnson. "Wow what an incredible performance." Turner's composure was incredible by anyone's standards, let alone a player who made their ODI debut in the series opener and arrived at the ground expecting to carry drinks. The 26-year-old, recalled when Marcus Stoinis' bid to play with a broken thumb was scuppered, has produced similar clean striking in pressure-laden situations during the Big Bash League. On Sunday, he unleashed against a star-studded attack headlined by the top-ranked ODI bowler in the world Jasprit Bumrah. A missed stumping from Rishabh Pant, which prompted the crowd to chant the name of rested icon MS Dhoni, gave Turner a chance on 38. Screaming fans were left shell-shocked as India dropped their bundle plus catches when Turner was on 74 and 80. Australia is now in position to record its first ODI series win overseas since 2016 and a first ODI series win in India since 2009. "The more pressure you can put yourself under going into a World Cup is great. It's very, very good prep," Handscomb said. Aaron Finch's team was 2-0 in the current five-match series and had won four of its past 26 completed ODIs, underlining why its World Cup defence appeared to be in such a sorry state. Now, selectors will struggle to find two obvious batsmen to drop from the current 15-man squad as they prepare to rush Steve Smith and David Warner back for the 50-over tournament. Virat Kohli described the pitch as a belter after winning the toss and some 717 runs were scored in total. Shikhar Dhawan and Rohit Sharma's brutal 193-run opening partnership set the tone. Dhawan (143) and Sharma (95) hammered Australia's bowlers all over the pint-sized park in a 125-minute onslaught, setting the platform for a total of 9-358 that would have been bigger if not for Pat Cummins' career-best figures of 5-70.